The Teachers Registration Board has a new phone number. If you need to speak to us please call 8253 9700. Teachers’ careers today can shape the teaching profession tomorrow. 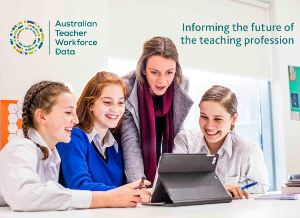 Introducing the Australian Teacher Workforce Data strategy (ATWD). For Australian students to have the best education possible, we need to understand the experience of the teachers who educate them. How many teachers leave the profession? In their first year? In their first five years? How does professional learning really impact teachers’ careers in the long-term? How many graduates actually enter the classroom? And where are they finding jobs? The ATWD will collect data to form a national picture that will help answer these and other long-held questions, helping us make real, evidence-based improvements for the teachers of tomorrow. MindMatters is a mental health initiative for secondary schools that aims to improve the mental health and wellbeing of young people. It provides school staff with blended professional learning that includes online resources, spotlights on topics relevant to schools, face-to-face events, webinars and support. All content has been informed by strong evidence in the area of school mental health and wellbeing. The use of MindMatters’ comprehensive resources has mental health benefits for the entire school community – including students, families and school staff. Find out more on their website. Kodaly Music Education Institute of Australia is holding a Building a Thriving Music Program workshop about developing the all-round musician in secondary school. Saturday 19 May, Adelaide West Uniting Church, 312 Sir Donald Bradman Drive, Brooklyn Park, 8:45am – 1:00pm. Non-members $65, members $35, students $20. Contact marglange2@bigpond.com for more information. Supporting Students on the Autism Spectrum in Primary School for SSOSs and ESOs. Wednesday 23 May, 9:30am-4:00pm, members $165, non-members $175. Supporting Primary School Students on the Autism Spectrum. Wednesday 30 May, 9:30am-4:00pm, members $165, non-members $175. Both workshops are being held at Autism SA, 262 Marion Road, Netley. Find our more information here. The Botanic Gardens of SA is holding: Aboriginal History and Culture – Teacher Workshop. Join Aboriginal educator, storyteller and guide, Trent Hill, for a journey through Adelaide Botanic Garden. Trent will investigate the rich relationship between Australian Aboriginal people and plants, and how plants have traditionally been used for food, medicine, shelter, tools, hunting and ceremony. Thursday 24 May, 4:30pm to 6pm at the Adelaide Botanic Gardens. Cost: $30 (+ booking fee). To find out more and to book click here. Leadership: Developing your capacities in the early stages will assist you in identifying skills and knowledge to build on for a leadership role. A PD Education Services session on Friday 18 May, 9:00am -3.00pm at The Highway, 290 Anzac Highway, Plympton. Cost $120. To book click here. For further information contact here. Mindfulness & Wellbeing Weekend for Educators: Delve into the joyful and relaxing practices of mindfulness, plus ‘taste-test’ a diverse range of other holistic and wellbeing methods in your role as an educator. Saturday 26 & Sunday 27 May at The Monastery, Cross Road, Urrbrae. Cost: $395 pp. Find out more here. The Australian Literacy Educators’ Association SA presents Vocabulary teaching to enhance literacy learning, presented by Sheena Cameron & Louise Dempsey. Thursday 3 May, 4:30-7:30pm at the Education Development Centre, 4 Milner Street, Hindmarsh. Individual members $100, institutional members $120, non-members $150 and students $60. To find out more or to register click here. Registrations close 27 April. The SA Maritime Museum is holding a full day professional learning session for teachers of Reception to Year 7 that includes digital learning based on the exhibition Leviathan – An Astonishing Science and History of Whales. Thursday 26 April, 9:30am-4:00pm, 119 Lipson Street, Port Adelaide. Cost: $25. To find out more click here. To book click here. Special Education Planning is holding Positive Behaviour Support: An approach for tricky behaviours, a workshop that provides practical and relevant ideas to implement positive behaviour support for children/students with autism or other developmental delays. The presenters include a special educator and two qualified behavioural therapists. Essential Assessments is holding a free two hour workshop on Student assessment and using data to inform teaching practice. Being held on the 30 April, 4:00pm – 6:00pm at the Hartley Institute, 54 Capper Street, Kent Town, To find out more or to register click here. Parliament House, Migration Museum and Centre of Democracy (meet at Parliament House). Explore the links between these institutions and your learning and teaching programs. Wednesday 18 April, 9:00am-4:00pm. Cost: free. A certificate of attendance and lunch provided. For more information click here. For TRT’s, Creating an Engaging and Supportive Learning Day, Friday 27 April, 1:00pm – 4:00pm. Cost $66 pp. Australian Curriculum: Have you got it all together?, Thursday 26 April, 9.00am-12.00pm. Cost $66 pp. Learner Agency: Who controls the learning in your learning space?, Friday 27 April, 1:30pm-3.30pm. Cost $66 pp. Less Behaviour, More Learning, Friday 27 April, 9.00am-12.00pm. Cost $66 pp. All events are being held at the Education Development Centre, 4 Milner Street, Hindmarsh. Autism SA is holding Empowering Individuals on the Autism Spectrum with Dr Wenn Lawson. Through this workshop Dr Lawson will explore the idea that there are specific learning styles associated with people on the autism spectrum. This compelling presentation will examine the specific cognitive processes utilised by individuals on the spectrum to comprehend and make sense of their world and discuss how these differ from the processes of the neurotypical population. Cost: members $175, non-members $195. The University of Adelaide is holding a free Stem and Coding workshop for middle primary to Year 10 teachers. Participants will be shown how they can take students on a coding journey whereby they will learn the basics, but progress quickly to the use of more complex devices without having to master complex coding. You will undertake several coding activities to teach to your students and you will take away an understanding of how coding can promote the transfer of learning across and between subjects. Wednesday 18 April, 9:00am – 12pm in Room 422, Horace Lamb Building, University of Adelaide. My Children Don’t Know Times Tables – Why? For booking details click here or email primarymaths@bigpond.com.